When directors join a board, they expect to receive and read the governing documents. The bylaws, policies and articles of incorporation outline board authority and limitations. But what about board decorum? Decorum is the behavior of directors considered to be correct, polite, and respectable. There are director expectations not written in the governing documents. They are described in a page titled "board decorum," "ground rules" or "cultural expectations." Karim Shaaban, IOM, Program Director, Jordan at the Center for International Private Enterprise (CIPE) offers, "What values and behaviors should be encouraged on the board, and what should be avoided? Is the leadership ethical, efficient, humble and fostering a democratic process, or do director behaviors hamper board progress?" Without identifying and communicating decorum, directors learn by trial and error or remain unaware of expectations. To establish decorum or guidelines, start with a discussion among officers and the executive director. "What do we expect members to do and how should they behave," is the question. The discussion can be completed with the full board, "What do you think is important for a board that is not described in our governing documents?" The place for debate is inside the board meeting. Once a vote is taken, directors should not express dissenting views after the meeting. Decisions of the board shall stand. Promote a culture of trust. Maintain focus at meetings by turning off phones and tablets that cause distractions. If access to messages is a priority, turn them to vibrate. Texting others in the meeting is discouraged. Take emergency calls outside the meeting room. 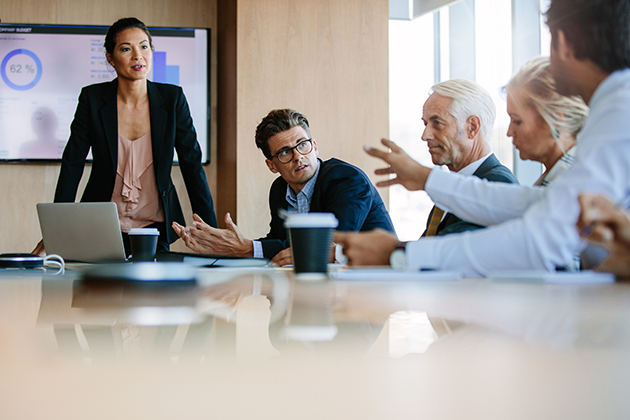 Board meetings are infrequent; thus, directors should remain engaged in between meetings. Ways to do this include interface with members, attending events, and preparing for the next meeting by reading and asking questions in advance. To respect the time of volunteers, meetings will start and end as announced. It requires a quorum of directors to conduct business. Be on time or arrive early. During meetings help us avoid wasting time with questions that might be irrelevant or better addressed before or after the meeting. The community views directors as representatives of the organization. Whether posting on social media or enjoying a beverage at a local tavern, people will judge director behaviors. Be careful posting on social media — it may seem personal but others scrutinize your words and actions. When not representing the organization, be sure to remove the association’s official nametag. The board chair has a responsibility to complete the agenda. If you have something to add to a discussion, ask to be recognized; "Madam Chair, I’d like to be recognized to provide information." Raise your hand or ask for the floor. Sidebar conversations are a distraction and rude to the person who has the floor. Adhere to the set agenda; it serves as a road map for the meeting. Frequent distractions at meetings are problematic. Be mindful of phrases like, "I just have a question," and repeatedly starting statements with, "I hate to be the devil’s advocate." Information shared in a board meeting may be sensitive, for instance grievances, contracts or finances. Follow lines of communication for announcing board news. Treat discussions and documents confidentially. Beware of posting board news to social media. Directors take on varied roles. In addition to governance, they may be asked to raise funds, chair a committee, or testify before a governmental body. Directors should respect the authority and limitations with each role. Preparation is a fiduciary duty. Read reports or the consent agenda in advance of the meeting. Many questions can be answered beforehand. Be sure the official governing documents are read and understood at the start of a term. Directors will interface with new people and ideas. Be respectful and avoid being judgmental. One of the best director qualities is humility; not boasting about self but respecting all types of people, interests and practice settings. Plan to listen more than you speak. The board-staff relationship should be appreciated to maximize organizational effectiveness. There are many ways to contribute. Board members bring knowledge and resources to the organization. You may be asked to help enroll members or raise funds for a foundation or political action committee (PAC). Providing in-kind services may be as valuable as personal contributions. Have fun during the year. There will be successes and milestones to celebrate. Frequently recognize the good work of committees, officers, staff and fellow directors. Include the board guidelines in a leadership manual or discuss it at the orientation. Some organizations require directors to acknowledge the "ground rules" by signing the page. Bob Harris, CAE, provides free governance tools and templates at The NonProfit Center. He is on the faculty for the U.S. Chamber of Commerce and has worked in Amman, Jordan, Tokyo, Japan; Kiev, Ukraine; Phenom Penh, Cambodia; Cairo, Egypt; and Minsk, Belarus to help organizations. Bob received “Association Partner of the Year” award from Association Trends Magazine in 2012, and he has authored books on association management. To improve management he created the Association Self-Auditing Process, used by more than 20,000 organizations. He believes that nonprofit organizations should be as efficient as any commercial business.